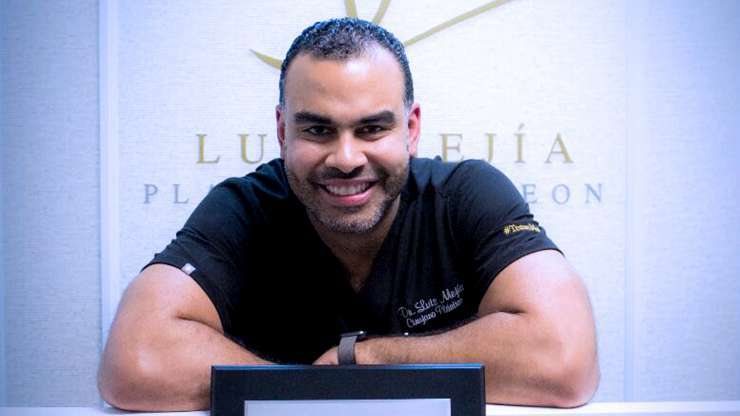 Luis Alberto Mejia Diaz, Graduated in the Dominican Republic from Universidad Iberoamericana (UNIBE), where he earned the degree of Doctor of Medicine in 2003. Completed a postgraduate degree in General Surgery at the Central Hospital of the Armed Forces (HCFFAA) in 2009, then heads to Caracas Venezuela in 2011, where he specialized in Plastic, Reconstructive, Aesthetic and Maxillofacial surgery at Hospital Militar “Dr. Carlos Arvelo “Caracas, Venezuela concluding in 2013. One of the major specialties done by Dr. Mejia is a Fellowship in Reconstructive Surgery Post-cancer at Padre Machado Oncology Hospital of Caracas, Venezuela, considered as a great merit granting him a fellow in medicine. While residing in Venezuela, Dr. Luis Mejia received signifcant training (practical and theoretical) with Dr. David Morales Bello, who is rated as the best surgeon in Venezuela and much of Latin America in the feld of Rhinoplasty (nose surgery), with more than 30 years of experience, where the famous Dr. Robert Ray (Dr. 90210) was also trained. His experiences as a plastic surgeon in 2014 in Caracas, Venezuela include: Unidad Quirúrgica Santa Rosa de Lima, C. C. Santa Rosa de Lima, in the Centro Metropolitano Cirugía Ambulatoria C.C.C.T., and in Clínica VIDAMED in Sabana Grande, Caracas. By the end of 2014 he returned to his native country, the Dominican Republic, where he opened his private practice in one of the most important centers of the city, the Centro Cirugía Plástica y Lipoescultura (CECILIP). Due to the knowledge he acquired abroad, he also decided to teach at the Universidad Iberoamericana (UNIBE) as Professor of General Surgery. Passionate about his vocation and giving 100% to his professional ethics, he is very demanding when it comes to results and most importantly, likes to maintain a safe environment to best serve the lives of those he works with. As a person he describes himself as sincere, friendly, humble, cheerful, and family oriented. Dr. Luis Alberto Mejia enjoys to lead with love and professionalism, making it one of his main tasks to provide a helping hand, which is why he uses his skills and knowledge to help children with congenital pathology. For this reason he became a part of the Fundación “Niño Simón” in Monagas, Venezuela, where he helps children with cleft lip and palate, among other physical deformities at birth. • “BREAST AUGMENTATION: VOLUME APROACH AND COMPLICATIONS. 5 YEARS EXPERIENCE” Mejia, L. Antoniadis, N. Sierra, D. Lima, A. 17 IPRAS World Congress, Santiago de Chile, 2013. • “INJERTO LIBRE DE PEZON PARA RECONSTRUCCION EN CANCER DE MAMA. APROPOSITO DE UN CASO.” Gonzales, T. Rojas, R. Mejia, L.
XLIX Coloquios Médicos Hospital Militar “Dr. Carlos Arvelo” Junio 2012, Caracas, Venezuela. • “LIPOINYECCION DE SURCOS NASOGENIANOS Y USO DE FACTORES DE CRECIMIENTO PLAQUETARIO UNIDOS A INJERTO DE GRASA” Garcia, N. Mejia, L. Sierra, D. Herrera, P. XXXVI Encuentro Nacional de Residentes de Cirugía Plástica, Reconstructiva, Estética y Maxilofacial, Maracaibo, Venezuela, 2013. • “ USO DE APOSITO DE HIDROFIBRA EN EL MANEJO DE QUEMADURAS DE SEGUNDO GRADO EN EL HMCA, EN EL PERIODO ENERO-JULIO 2011” Mejia, L. XIV Congreso Dominicano de Cirugía Plástica, La Romana, Republica Dominicana, 2012. • “INCIDENCIA DE QUEMADOS HOSPITALIZADOS EN EL SERVICIO DE CIRUGIA PLASTICA, RECONSTRUCTIVA Y MAXILOFACIAL DEL HMCA. ENERO 2009- MAYO 2011” Mejia, L.
XXII Congreso Venezolano de Cirugía Plástica, Marzo 2012, Caracas, Venezuela.